I was really taken with Fig 2 Design Studio. The Letters for Love project was one of my favorite finds–the team at Fig 2 teamed up with seasoned calligraphers to create beautiful cards (in neon pink!). A portion of the proceeds go to charity and these letter-loving gals aptly selected Oklahoma City tornado relief. I also was obsessed with the booth lady’s button: send more letters! There was lots of mail love friends. Meg, a soldier’s wife, is the mastermind behind Belle & Union. She sweetly partners with Operation Write Home, an incredible organization (and a whole other post) that sends stationery to soldiers overseas. 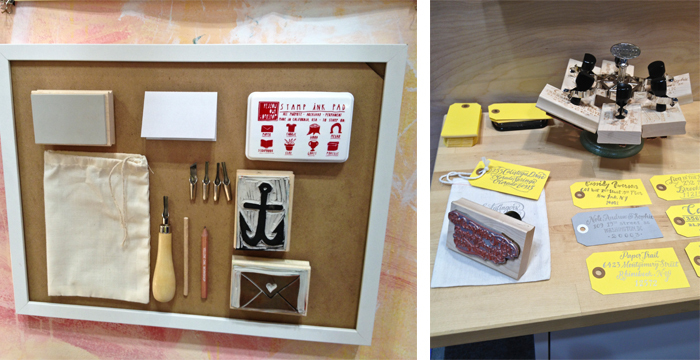 Fracas Studios had total treasures with custom stamp cards and cute red and blue pencils. And Ink Meets Paper wow-ed with modern simplicity. I swoon over any encouragement of letter writing. 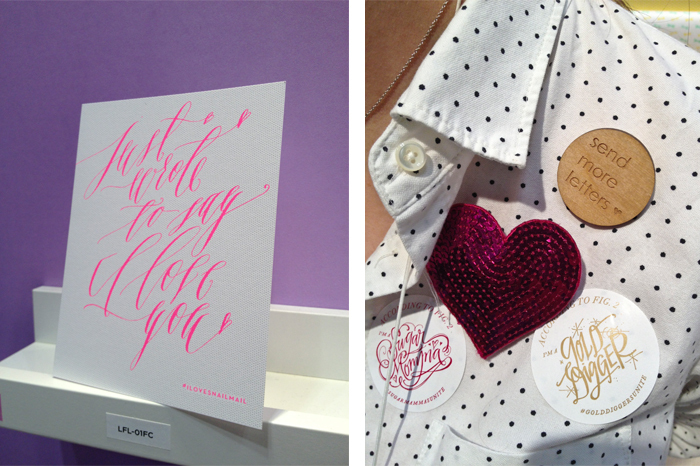 I was totally taken with Puddleduck Paper Co. 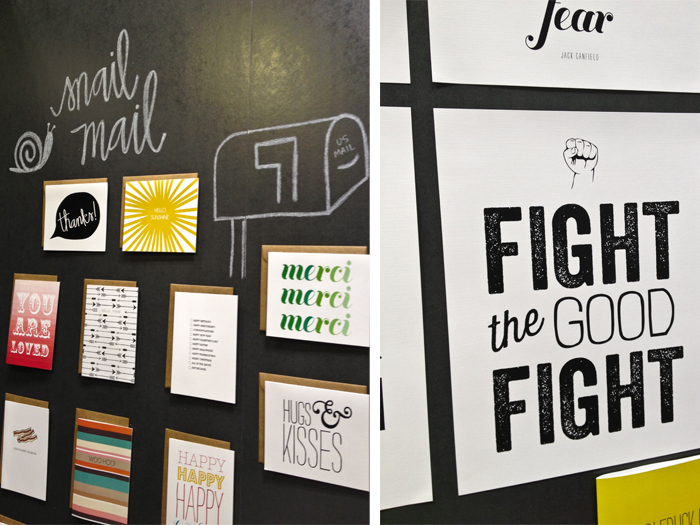 I loved the hand lettering, the kraft envelopes, the bold designs–I could go on and on! This gal really gets graphic patterning! I loved all the paper supplies, like gorgeous wrap from Mr. Boddington’s Studio, chic pens from Snow & Graham and some sweet mail-inspired stickers from 9th Letter Press. And the stamps! Oh the stamps. I loved the create-your-own kit from Yellow Owl Workshop and the gorgeous custom address stamps by Ladyfingers Letterpress. More post-inspired paper from Sugar Paper, letter writing kits from Pistachio Press and a nod to the postal workers from Grey Moggie Press (who’s motto is write more. on paper. –love!). 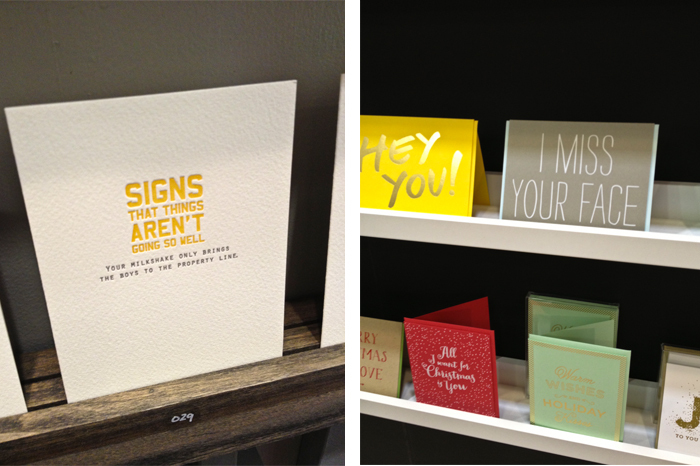 I am always impressed by the cleverness of Sapling Press. I mean, the wit is just unmatched! And The Social Type blew me away with their glitter and shine! They had the most adorable matchboxes (which I failed to photograph, duh) that would pair perfectly with a deliciously scented candle. It. Was. All. Amazing. If you ever have a chance to go, GO! Besides all the gorgeous paper, you’ll have unparalleled access to the designers, so you can ask super important questions like, “whats your favorite color,” wink!